Just stumbled upon this great Classroom Management blog by Michael Linsin, full of great tips for dealing with troublesome classes and students. Just stumbled upon the TEFLtastic blog and it’s full of amazing materials. 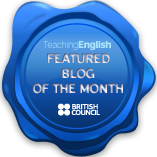 I’ve added it to my blogroll and I’m going to be using a lot of their great FCE speaking materials this year. Check it out. Macmillan’s free online resources are amazing! !